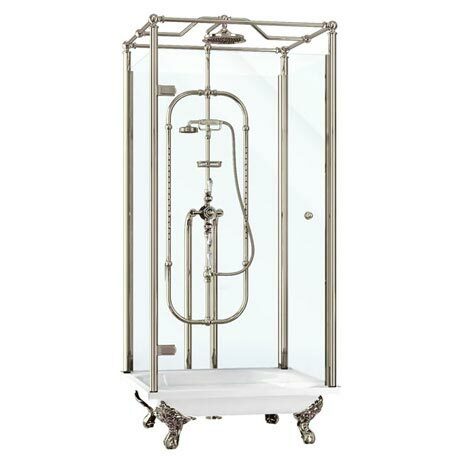 From Arcade, this Piccadilly Freestanding Shower Temple is an eye catching masterpiece. Crafted and hand finished with exceptional care using the finest materials and manufacturing process. This timeless design will fit into any traditional bathroom that will certainly add a classic and luxurious look and feel. This package includes a 1000mm stone resin tray with traditional legs and high flow waste, an Avon exposed thermostatic shower valve with riser which features a fixed shower head, handset, mist bar and soap basket and a hinged door enclosure which features 8mm safety glass with Easy Clean coating. All metal components are finished in a special PVD nickel coating which gives a superior finish and guarantees durability. Arcade products carry a 10 year guarantee.